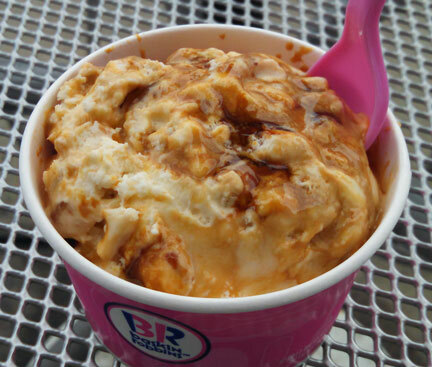 [New for April 2015] If you listened to the last episode of the Nosh Show then you know I promised to try the flavor of the month over at Baskin-Robbins. Granted I wasn't super excited because of my run in with their Easter egg hunt flavor, but a promise is a promise. I take a bite and my first instinct is to spit it out. Yes, it's that bad. Like really terrible kind of bad. The swirl has this weird kind of fake smokey food science muck going on and at times it almost has an alcoholic burn to it. For the first few bites, I was physically pausing and thinking "should I return this mess?" Man this stuff is offensive, but I pressed on anyway. The painful flavor is strong and invading every bite. I know sometimes we complain that a flavor isn't strong enough, but this is ridiculous. It's disgusting, it's fowl, and only ranting wants to out of me right now. The bits? yeah, they are a loss too. They should be smaller and maybe a bit sweeter. Instead they are borderline too big. I had one piece that was so big I thought it might get stuck on my teeth because there is a bit of stick to them, plus I felt like I was getting more of that nasty smoke flavor from the bits as well. I only managed to finish this one because I smooshed the swirl and ice cream all together to create a less offensive thing. Still bad, but not horrible smokey slime on my tongue bad. In closing... I've had creme brulee and you sir are no creme brulee. This stuff is GROSS. a lot. very. nasty. horrible. Proceed at your own risk. At the very least ask for a sample before buying this one. Had I gotten a double instead of a single scoop, I most likely would have returned it. This food science madness needs to stop. Baskin Robbins new flavors are now becoming less creative. Next month flavor is "mom making cookies"
Eww, that sounds awful. I wonder what on earth BR used to achieve that taste? I LOVED THIS FLAVOR!!!! The swirls was spot on and tasted just like a creme brulee. The chucks of sugar were a little bug. Sorry you didn't like it. Tried this and the Easter Egg one yesterday. Easter Egg was okay. I expected it to be so overly sugary based on your review, but didn't find it all that bad. There were an excessive amount of candy bits in it that left me constantly crunching down on chocolate chucks. As for the Creme Brulee one - At first bite I didn't taste anything. The base had little flavor. Then I got a huge spoonful of the ribbon, and had to take a step back. It tasted harsh, and burnt. Very unappealing. The sugar crystals here and there were few and far between, and as you noted were too big. As of late, the flavors of the month have been pretty awful. @Sunnyh: no worries, just glad I got a small. 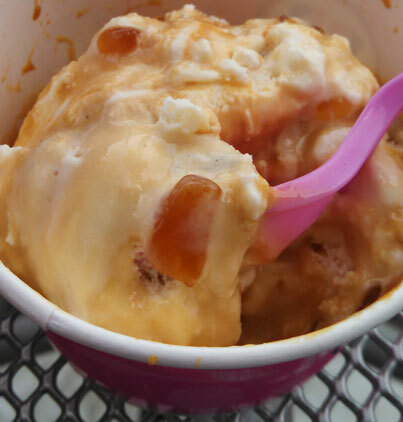 @TTB: as you can see in the photos, mine was covered in swirl and it was unavoidable on my first scoop. Mom's Making Cookies was delicious! Way better than I expected. Totally worth trying! Ummmm, where did you have this exactly? As far as I know it hasn't been around since April 2015.